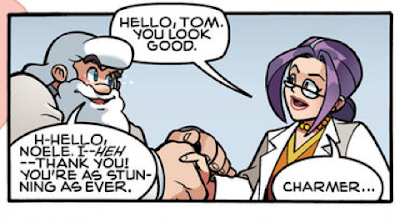 Dying to get your hands on the latest issue of Archie's Mega Man? Well, Destructoid's got a little something to keep your appetites whet. Tony Ponce just posted a nice preview of issue #13, which kicks off the brand-new and eagerly anticipated "Spritus Ex Machina" arc. The new arc is a completely originally story featuring a blend of new and old faces. Dr. Cossack, Rush and Pharaoh Man make their grand debut, and then there's the mysterious Dr. Lalinde; a supposed love interest for ol' Dr. Light. Just look at the swagger up there. His game is on! Oh, and let's not forget those Super Adventure Rockman references. If our solicitation information is anything to go by, issue #13 will re-introduce readers to the forbidden LanFront Ruins where Dr. Wily hopes to discover an elusive power. I wonder what that could be? Whatever it is, Wily intends to use it to give him a little edge. The issue should be arriving soon-ish but until then, check out Destructoid's selection of preview pages. Well it's definitely after SaR and before 4 then. Interesting. Not TOO far of a time jump. That's Doctor Tom to you! At least she looks Light's age now, the picture of her on the cover looks young enough to be his daughter. It's not after SaR. It's after a different version of the opening scene of SaR that establishes that there are some ruins the U.N. couldn't figure out. He's not doing MM4 and he's not doing SaR. He's doing a story not based on any particular game that sets up a few things so that when it's time to adapt SaR and MM4 the characters and locations will be familiar to the readers and characters. As for LaLinde's appearance, I suspect half of it might be that Jonathan Hill draws mature women that way, but at least some of her design is probably hinting that she's a little shady. I know Inafune had a tendency to draw big shoes on everyone, but Lalinde's feet are kind of hard to look at... It's just... no. Or many examples of women at all for that matter. You know, the art isn’t half bad. I was expecting something really away from the Spaz and Bates thing, but I have to say, that’s some really nice art. Man, I need to start reading this. I hope my aunt got my email and bought the first two arcs. Anon6: I guess that does put things in perspective. The artwork is awkward and all, but compared to what Sonic has endured over the years... Yeah, not so bad after all. But it's still a shame all the same. This story arc sounds exciting and I have a feeling the art is going to detract from that. Oh well... at least the guy did a stellar job on the Pharaoh Man variant. And heck... We still have time for him to improve as the story arc progresses. Gotta stay hopeful. As for not having human women to reference, why not just turn to the BN/SF series for inspiration? Tesla Magnets or Ms. Millions would have been great references. The Doc is old, so anything gonna look good to him anyways lol. But once she gets her hands on the One Billionth Ring, she can wish herself young again.